Laura J. Steinberg, Ph.D., is a professor of civil and environmental engineering in Syracuse University’s College of Engineering and Computer Science (ECS) and a special assistant for strategy to the vice chancellor for strategic initiatives and innovation. She also holds an appointment in the department of public administration and international relations of SU’s Maxwell School. 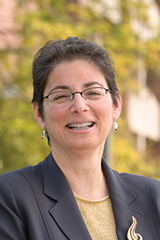 Prior to her current roles, Steinberg served as Dean of ECS. Steinberg’s research focuses on infrastructure management and finance, disaster management, environmental modeling, and engineering education innovation. Her past work includes risk analyses for the prevention of technological disasters; a study of design choices contributing to the failure of New Orleans floodwalls as a result of Hurricane Katrina; analysis of infrastructures used by terrorist organizations; and modeling of infrastructure resilience. She currently studies academic collaborations between engineering and public policy faculty. Steinberg served on the EPA Science Advisory Board’s Drinking Water Committee and has contributed to major scientific journals as an associate editor and an advisory board member. She has also held leadership roles for the American Society of Civil Engineers. Steinberg holds a B.S.E. in civil and urban engineering from the University of Pennsylvania and an M.S and Ph.D. in environmental engineering from Duke University.